CentreBet, SportingBet and Tom Waterhouse merged to form William Hill. Free live streams of horse racing from both Victoria and NSW racetracks. 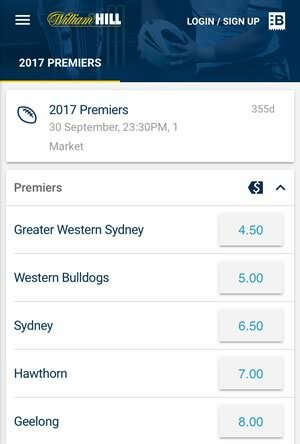 Wager on the AFL, NRL, cricket, tennis and any Australian sports from your phone. Watch a live stream of dozens of off different sports on your smartphone. ​Easily create sports and horse racing multi-bets from your iPhone or Android. William Hill is one of the biggest names in mobile sports betting, with a presence around the world. 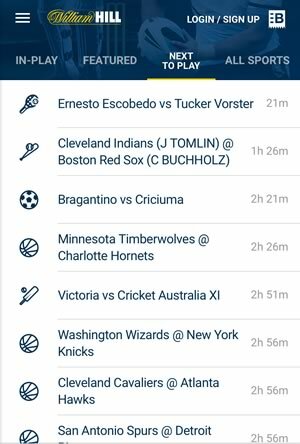 The William Hill Australia mobile app is another extension of that presence, with a rock solid list of features, as well as a set of betting markets that will appeal to Australian sports bettors directly, in addition to betting markets for major sports around the world. As far as features go, William Hill boasts an impressive array of them, led by their live streaming platform. Mobile sports bettors will be able to live stream matches from major soccer leagues such as Spain's La Liga right from their devices as long as they have an active account with William Hill. Every year William Hill live stream thousands of major football, tennis, rugby, cricket and athletic events via their iPhone and Android apps. Since actually watching the games that you wager on is the most fun part about sports betting outside of winning, the ability to watch live sports in the same place that you bet is very convenient. A major draw within the William Hill mobile app's live streaming capabilities is their exclusive streaming rights to the New South Wales thoroughbred races. In addition to NSW racing, they also broadcast live horse racing from Melbourne and other racecourses in Victoria. Of course, with this being an Australian arm of an iPhone and Android sportsbook, rugby and Aussie Rules Football are essential to having a quality operation, and William Hill delivers. They offer a variety of markets on both the Australian Football and NRL, as well as visualizations during matches and live in-play betting on these two elite Australian leagues. Their multi-bet builder allows players a way to get creative with their wagers for the chance to win big. Players can create multi-bets from anywhere between 2 and 20 teams, with the odds for each of their picks multiplying along the way. This includes futures bets, including selections to win the NRL and AFL, which gives players potentially lucrative action without having to spend a ton of money, action that can last for long periods of time depending on whether or not futures bets are played. In addition to the NRL and AFL visualizations that are visible during matches at William Hill, their in-play section offers them for other marquee sports such as football and tennis as well. 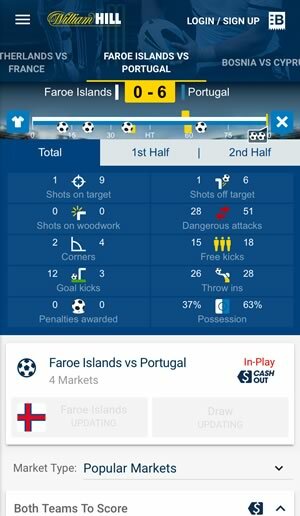 They also provide live stats that are relevant to each of the markets they offer, including things like possession and shots on target in soccer or yardage numbers in football. 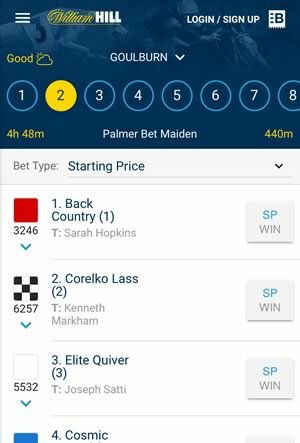 The design interface for William Hill is easy to navigate, with all of the important menu items just one tap away in the top left hand corner of the app. 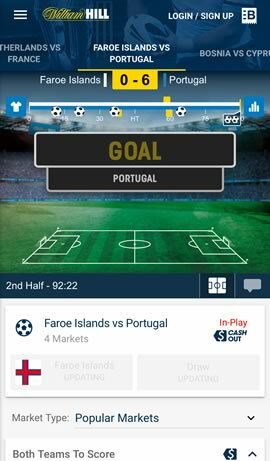 The app looks sleek, with easy to use and visually appealing ways to tap out your wagers without any unnecessary movement. This is especially true of the racing section, in which you can select the exact finishing positions of a number of horses by simply scrolling through the field for each race while tapping where you think they will end up. William Hill offers mobile sports bettors countless betting markets, including one of the best selection of NRL and AFL markets in the sports betting industry. Their American sports selections are also impressive, with comprehensive odds on the NBA, NFL, NHL and other notable American sports. All in all, it is clear that William Hill knows what their players want in Australia, with great attention to detail on both the NRL and AFL, as well as a strong live streaming platform. When looking to invest your money in iPhone or Android sports betting, you could certainly do a lot worse.